Discussion in 'Tow Vehicles, Hitch & Towing' started by TRR, Sep 11, 2018. JimmyM and gladecreekwy like this. What can I say but....WOW!!!! Is that real? Several accident scenarios popped up in my mind... while looking at the pics. Kampus, nineoaks2004, kcsa75 and 1 other person like this. 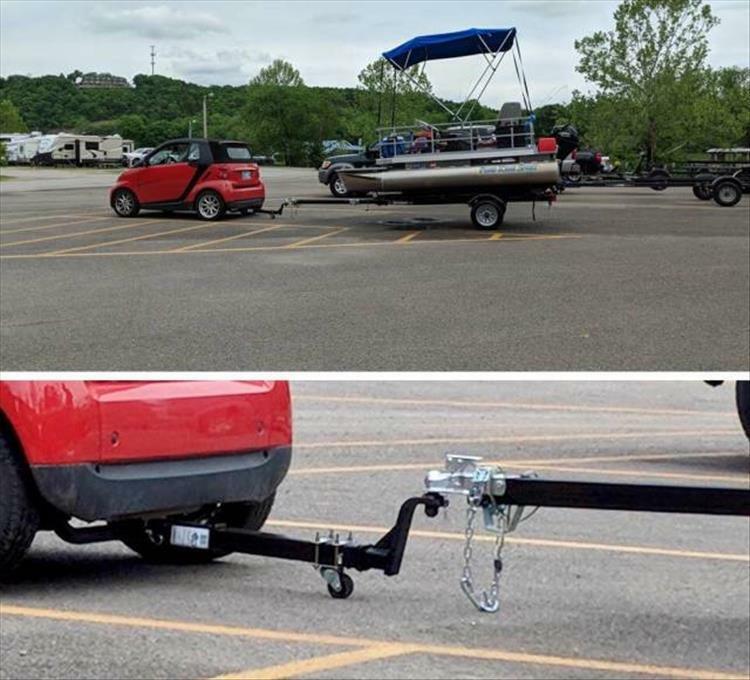 i'd chuckle when I see the Smart car trying to stop itself from going in water with the pontoon boat.... on ramp. No way! That little plastic wheel would not last 10 minutes on the road. This must be the wishful thinking pic they took before actually trying it. Maybe he just moves things around the lot. Rusty2192 and Sjm9911 like this. I'm guessing they only tow from the campsite to the ramp. See the RVs in the background? Believe it or not, a similar device was sold years ago for towing large trailers with sedans. If you pay attention in "The Long, Long Trailer" you will see one on the car Desi is driving. Loved that movie I need to watch it again, it's been years. It reminds me of the movie RV, that is some of the dumb things that they did would fit right into this scenario.